Oh One-Eye, so valiantly dueling with Vaguely Effeminate But Still Totally Imposing. And then maybe Lady Armor shows up. Or maybe Guy Who Fights With a Big Metal Ball For Some Reason. 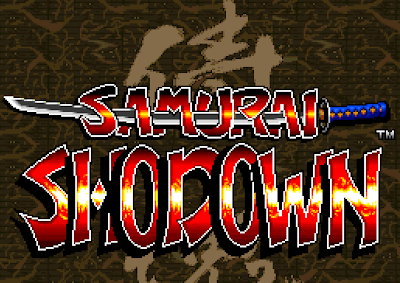 I have previously spoken of my affinity for a bygone game called Samurai Shodown. Feudal Japan. Swords. People yelling things in other languages. There’s a dog in it somewhere. That’s all that my eleven-year-old brain needed to be happy. That all my brain needs to be happy now, come to think of it. The thing about this game is that it spells “showdown” without the “w.” To this day, whenever I have to write or type the word myself, I have to stop and remember whether it actually uses the “w” or not. Go easy on me. I'm sure there's a good number of kids my age who legitimately thought combat was spelled with a "k" for similar reasons. I never understood why “Shodown” ever came to be an acceptable substitute for “shodown” until recently. Apparently, those translating the game from Japanese to English found the original title, Samurai Spirits, uninspired and wanted to change it. However, doing so with the substitution of the spelling of “showdown” cause a problem in that it would have added an extra letter space to the design of the opening title screen. Thus, the “w” was dropped. Yesterday, I was passing downtime with unbridled video game nostalgia and stumbled upon another game — this one unfamiliar — and realized that it also pitted residents of feudal Japan against each other in deadly combat and also did so under a title with an obvious grammatical error. 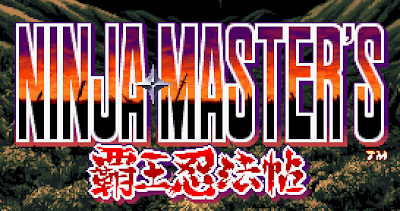 Can I introduce Ninja Master’s? Yes, the grocer's apostrophe existed even in feudal Japan. So what, then, should that possessive noun be attached to? Ninja Master’s Fight? Ninja Master’s Putting Challenge? Ninja Master’s Make-Out Party for Other Ninja Masters, Especially Ones That Are Boys, Especially If They're Also on the Soccer Team? Without having played the game, I can't really answer that. I always liked these games too, but I have to say that the three-dimensional ones never really grabbed me the way the hand-drawn two-dimensional ones did. Though hand-lopping sure looks like fun, I feel way more excited about Samurai Shodown Anthology, the collection of all six of the 2D games, which is heading for the Wii and the Playstation later this year, which should be exactly around the time I begin to tire of Smash Bros. Brawl. Roughly: "Ninja Master's Scrolls of the Supreme Ninja Arts". I used to wonder about Samurai Shodown, too, but I associated the 'Sho' name with the word 'Shogun' on the grounds that the games are set around the time of the shogunate era (or at least that's as much as I could figure out when I was 14 and playing Samurai Shodown II in the arcade :) Anyhow, I guess the idea stuck because I hadn't thought about it in a long time. Thanks for pointing out the character length thing, that makes sense! PS: I just recently found your blog -- great stuff!